The shoulder joint is indeed quite a complex one. It isn’t a single joint really but comprises 2 joints – the Glenohumeral and the Acromioclavicular joints, which is the union of the 3 bones – Clavicle, Scapula and Humerus. It is the extraordinary design of the bones of the shoulder joint that makes it the most flexible joint in the human body! Here is a quick look at each one of them. The clavicle is also known as the collarbone and is actually the only bony attachment between the trunk and the upper limb. It is the very bone that forms the anterior part of the shoulder. It has a gentle ‘S’ shaped contour and at one end of the clavicle, there is the sternum, and the acromion of the scapula at the other. The roof of the shoulder is the articulation of the acromial end of the clavicle and the scapula’s acromion. 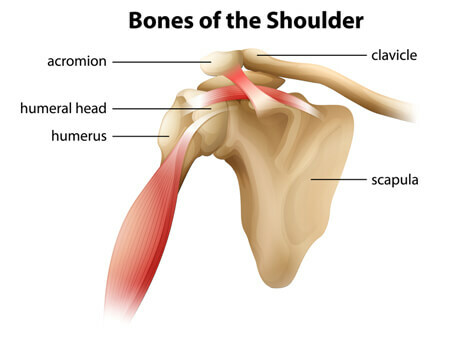 It is basically triangular in shape and has three processes called acromion, spine and coracoid. It houses the glenoid cavity, which houses the head of the humerus; its very socket. It is the scapula’s flat blade, which moves to and fro at the back of the chest, that allows the extended movement of the arm. This is the bone that runs from one’s shoulder to the elbow – the connector between the scapula and the bones of the forearm, radius and ulna. Its head is half spherical and resides in the glenoid cavity where, it meets the scapula. The bone has a thin neck and two processes. The humerus also has attachment sites on it for the rotator cuff muscles to attach, known as the greater and lesser tubercles. If you would like to know more about anything regarding the shoulder, please do feel free to get in touch with us!